A medicine cabinet is more than just a piece of storage furniture. This bathroom essential can be put to many uses. From providing space-friendly storage to meeting your grooming needs, medicine cabinets have a lot of significance. You might think that all medicine cabinets are alike, but you are wrong. These Medicine cabinets come in different designs, shapes, sizes, and material. Each has its own unique feature geared towards proving a better fit to your bathroom. With some research, finding the right medicine cabinet that fits your needs can be quite easy. When planning to purchase one, more focus should be placed on the type of items you plan to store, the shelving options, storage capacity, and ease of maintenance. There are lots of options out there. So we’ve come up with a roundup of the best medicine cabinets that you ought to consider. This is a modern medicine cabinet made of sturdy wood. It has a mirrored door fitted with decorative framing pulls. The door opens easy via a crystal knob that adds a touch of beauty to this cabinet. Modern lines combine with lavish crown molding to make it a true masterpiece. The cabinet has a bottom shelf with adjustable dividers that create up to three storage cubby holes. It’s finished in a neutral white color that blends well with any existing decor. 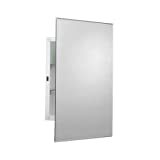 This is a sleek, frameless medicine cabinet that looks great in modern bathroom settings. The cabinet is made of anodized aluminum that’s resistant to rust and chipping. It’s fitted with a 1/2-inch mirrored door that opens to 108 degrees to give easy access. The cabinet has two shelves that can be adjusted to accommodate toiletries and other bath items. It comes with a side kit that makes surface mount installation much easier. 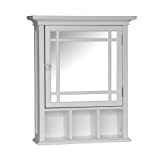 This medicine cabinet comes in a contemporary styling made of thick MDF board. 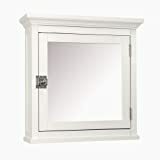 The cabinet has a large mirrored door fitted with a polished silver knob to pull open with ease. A cool blend of recessed paneling and crown molding takes the contemporary styling of this medicine cabinet a notch higher. The door opens to reveal a storage shelf that can be adjusted for custom storage. This cabinet is given a splash of pure-white finish that looks more classic. 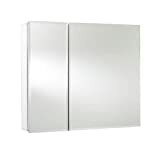 Zenith EMM1027 medicine cabinet comes sleek with a modern appeal. The sleek design makes it easier to fit into an existing recess. 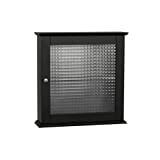 The cabinet body is made of powder-coated steel for maximum durability and protection from rust and corrosion. A large mirrored door covers the entire front surface. There are 3 shelves two of which can be adjusted to meet your storage needs. 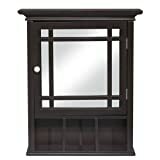 This medicine cabinet comes in a charming espresso finish. It gives ample enclosed storage. The cabinet has one fixed shelf hidden behind the door. The waffle textured pattern used on the glass door gives it a frosty look. A double plated knob fitted on the door adds more charm. The cabinet is made of wood carved in angular moldings and modern lines for that classic touch. It comes with the necessary hardware for easy assembly. This cabinet is made of Bamboo to give that natural blend. A dark espresso finish used on the body of the cabinet creates a cool contrast with a mirrored door. The door sits behind a mirrored grid frame for added protection. A bevel molding is given to the sides, top, and bottom of the cabinet for that modern touch. The bottom of the cabinet has three cubby holes for storage. Additional storage is provided by an interior shelf that can be adjusted to fit items of different heights. KOHLER K-3073-NA is a medicine cabinet with a pretty cool modern twist. It comes stylishly in an arched mirrored design. Mirrors are fitted to the back of the door and the cabinet. The cabinet has anodized aluminum construction resistant to rust and chipping. There are two interior shelves made of durable tempered glass. Adjustment holes make it easier to adjust the height between shelves to fit items of different sizes. The door swings open to 108 degrees for easy access. This is an elegant, sophisticated medicine cabinet. The cabinet has an aluminum body to give a lightweight durability. There are two mirrored doors that open to 165 degrees so you have an easy time accessing personal items. This cabinet stores a ton of items and keep them organized. That’s achieved via 5 adjustable shelves that fit items of different sizes. This medicine cabinet comes with a bracket that hangs and locks it in place. It’s designed for surface or recessed mounting. 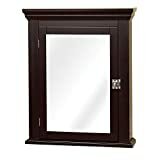 Zenith MC11CH medicine cabinet finished in espresso gives a traditional elegance that has a timeless appeal. The body of the cabinet is fabricated from wood carved in crown molding and stylish modern lines that give a classic early American feel. The cabinet is fitted with a mirrored door adorned with polished chrome hardware. There are 3 shelves hidden behind the mirrored door. Two of the shelves are adjustable to the size of the items you plan to store. 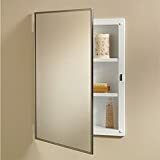 This is a standard size medicine cabinet designed for recess mounting. The cabinet has a plastic body optimized for aesthetics and durability. It gives the convenience of ample, hidden storage provided by 3 interior shelves. The shelves are adjustable to the size of the items you want to store. The door is attached to quality piano hinges and has a magnetic closure mechanism for smooth operation. This door is reversible for easy left or right-hand opening.